When time is a luxury that you just don’t have, and you need your conference participants to join your call without incident, EventMeet by Compunetix is right for you. 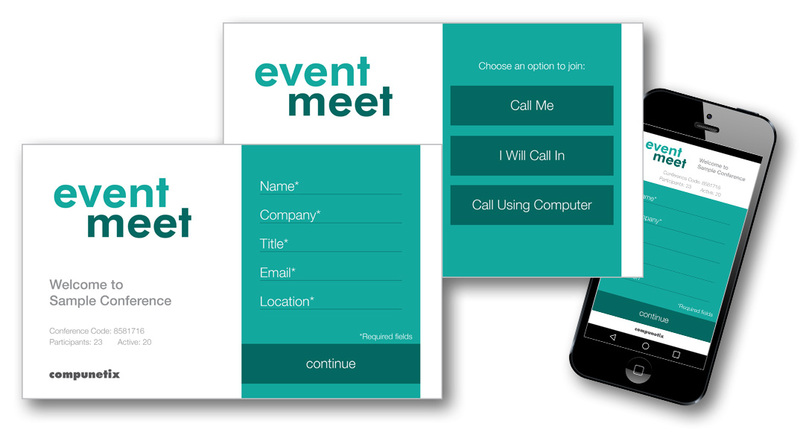 EventMeet is the specialized web application that streamlines caller entry into event conferences. It gives parties an unprecedented access point from which they can instantly join the call. The only thing users have to do is enter the required participant and security information, and click to join. With EventMeet, the caller is in control. There is no waiting in line for an operator. Users merely type in the requested information and join the call – fast, simple, and secure. It also minimizes operational requirements by alleviating the stress that event conferencing places on your operations team, freeing them to focus on your specialized event services. EventMeet is built upon the robust Compunetix CONTEXWeb™ suite and is tightly integrated with our award-winning event feature set, enabling users to experience all the benefits of advanced CONTEX conferencing. Check out the newly re-designed EventMeet interface today!